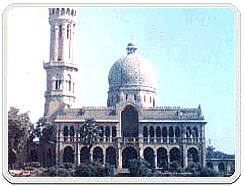 Designed by William Emerson, the Muir College in Allahabad is an outstanding mix of Gothic and Indian architectural elements. Commenced in1874 and opened in 1886, it has an arcaded quadrangle, which is dominated by a 200 ft minaret tower. The imposing minaret is built of cream coloured sandstone from Mirzapur, with marble and medley floors. The domes of the Indo-Sarcenic structure are clad in Multan glazed tiles.